Ages 5 through 11. Help students learn to identify differences between words with closely related sounds, identify sound changes within words, rhyme words, break down words into syllables, identify sound patterns within sentences, and MORE. The activities focus on individual sounds (consonants and vowels), sound contrasts, and phonological processing skills that are critical for success in learning to read and spell. Consonants. The activities provide opportunities for students to increase their awareness of consonant sounds as they listen to words, make comparisons, modify sounds within words, add sounds to words, and use sounds within sentence contexts. Vowels and Diphthongs. Sound contrasts are presented to help children increase their awareness of subtle differences that affect the meaning of words. In addition to sound identification activities, students also practice changing vowels within words to create new words. Identifying Changes within Words and Syllables. The activities in this section provide students with practice in locating the position of sound differences within words. Thinking About Words and Sentences. Students are asked to manipulate sounds in a variety of ways, identify words containing specific sounds, break words down into syllables, use sound cues to finish incomplete sentences, etc. Sound Picture Worksheets. Students are presented with pictures and asked to respond to instructions such as, "Draw a green circle around pictures of words that begin with the same sound as pin." A list of easy to spell words is included at the end of the book. 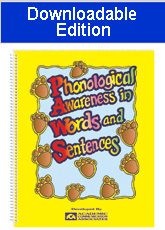 Words from this list can be incorporated into a variety of phonological awareness activities.